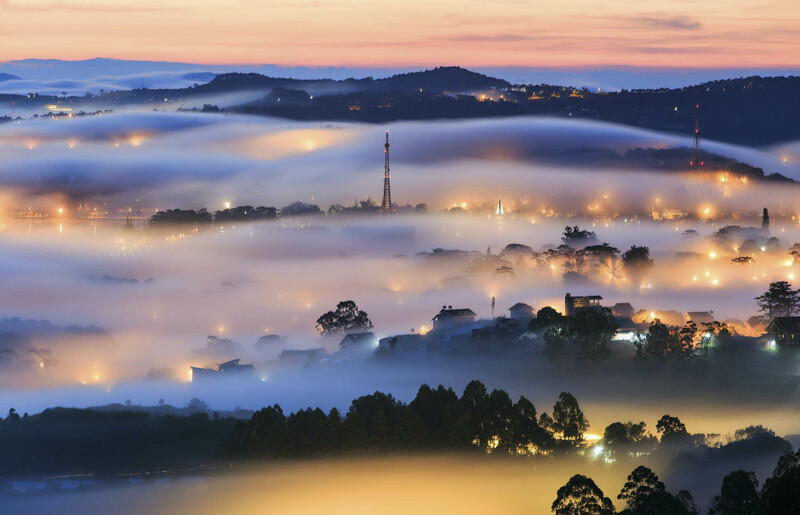 Dalat, also Da Lat (Đà Lạt), located in the South Central Highlands of Vietnam, was originally the playground of the French who built villas in the clear mountain air to escape the heat and humidity of the coast and of what was then called Saigon (now) officially known as Ho Chi Minh City. The city centre is quite small and feels very urban, concrete, and patches of streets and buildings are in disrepair or construction. However, outside of the small urban centre is a spacious landscape of well kempt and pretty hotels, cafes, restaurants, and lakes peppered among the rolling green hills and pine trees to offer tourists an escape from city life. Even further out from those are fields of fruits, vegetables, coffee, and canopied flower gardens that are harvested and exported across Vietnam. 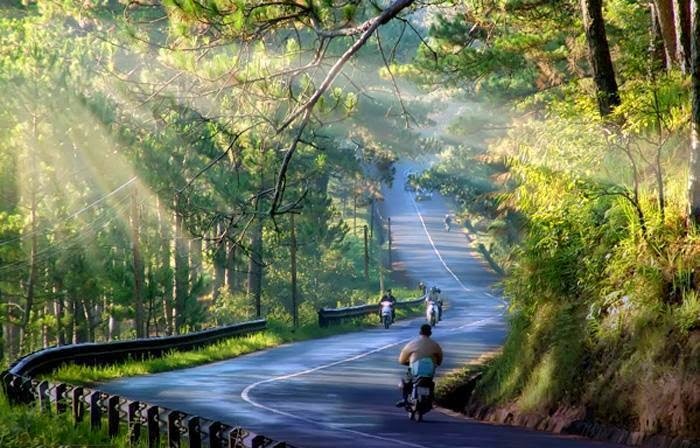 The tempo of life in Dalat is very relaxed, traffic is not frenetic except for the central area, streets are spacious, and the local populace is friendly to foreigners. 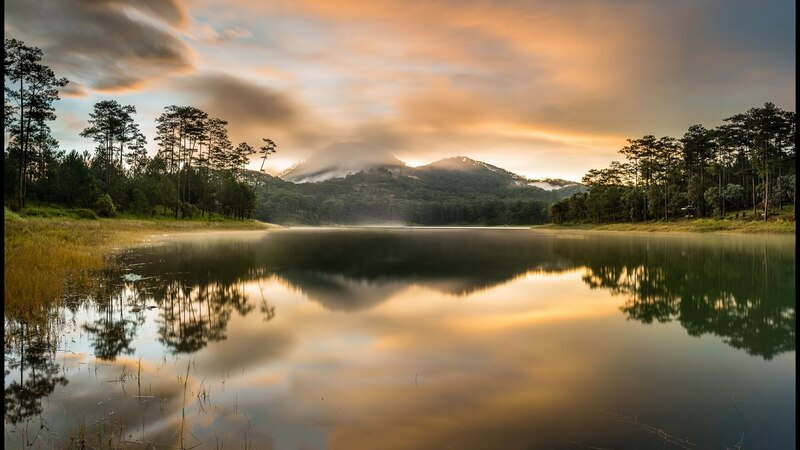 Dalat is very much a niche tourism town, open to those seeking a respite from the heat of the rest of Vietnam, a change in scenery to lush pine forests and rolling hills, or those seeking world class golf. There is a steady flow during some parts of the year of tourist from all walks of life and places, small hotels, cafe's lining its streets and plenty of small shops offering anything from orchids to knitwear. The vast majority of visitors are Vietnamese, although plenty of Americans and Europeans find their way, either on short package tours, soul searching, or drawn by the scenery, vivid blue skies, fresh air, flower-filled parks, and local culinary treats. 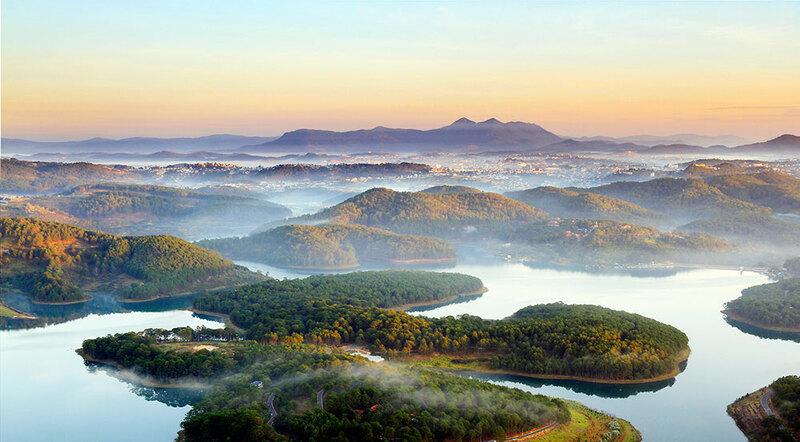 Dalat is a favourite destination for company weekend outings, family get-aways, and honeymooners. 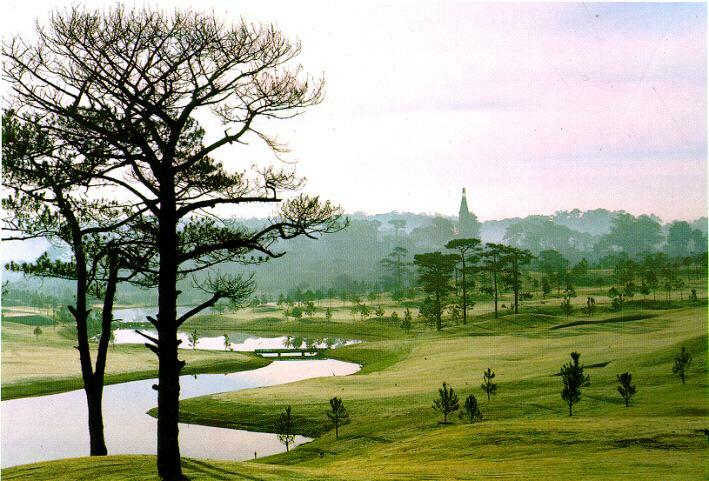 Most guidebooks for overseas visitors describe Dalat as a tourist town with a colourful approach to tourism. 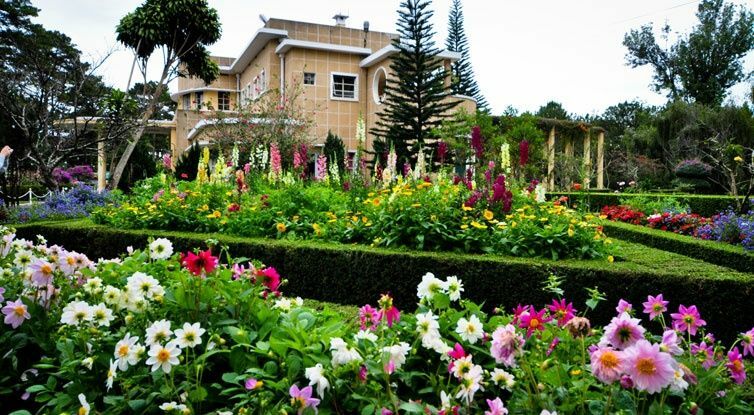 Dalat's high altitude (1500-2000m) and fertile landscape make it one of Vietnam's premier agricultural areas, producing varieties of fruits, vegetables, tea, coffee beans, and flowers that do not grow in the lowlands. In markets as far north as Hanoi and Hai Phong, vegetable and flower vendors will tout their "made in Dalat" produce. Most local and foreign travellers arrive in [Dalat] by bus, including those travelling on the famous Sinh Cafe Hanoi-HCMC open-tour bus. Private car service run several daily to Dalat from Nha Trang, Mui Ne and HCMC. From Nha Trang Phuong Trang Bus Station, the bus ride is about 3-4 hours, including a 30-minute breakfast/WC stop about one hour out of Nha Trang, and costs 145 000 VND including hotel pick-up. (Mar 2014)also other bus name is Nam phuong bus pick up at your hostel, and drop off i the middle of backpacker area, cost is 120.000vnd. From Danang - Danang Central Bus Station, sleeper bus from Danang to Dalat, departs from Danang at 17:00 and arrives Dalat at 8:00 - 9:00 am (15 hours), it costs 265.000/ticket, you may come directly to the Bus Station or online booking via email danangdalatbus@gmail.com. From Ho Chi Minh City, the bus ride is about 7 hours (9 hours if there is bad traffic leaving Saigon), VND240,000 on Phuong Trang's semi-sleepers. If coming from Mui Ne, be careful as the road is terribly rough most of the way, so try to book a large bus or at least a seat towards the front. Packaged day tours are easily purchased round town, which will take you to a variety of sites, it is recommended to use one of the three licensed operator, as they are registered with the tourism department, offer insurance coverage and in the event of any disputes, or grievances have to respond to the claims against them. Fair pricing policies apply to them, which might not be the case with some of more shady characters in the business, hence ask for the government registered license and receipt with a red invoice when contracting any services. 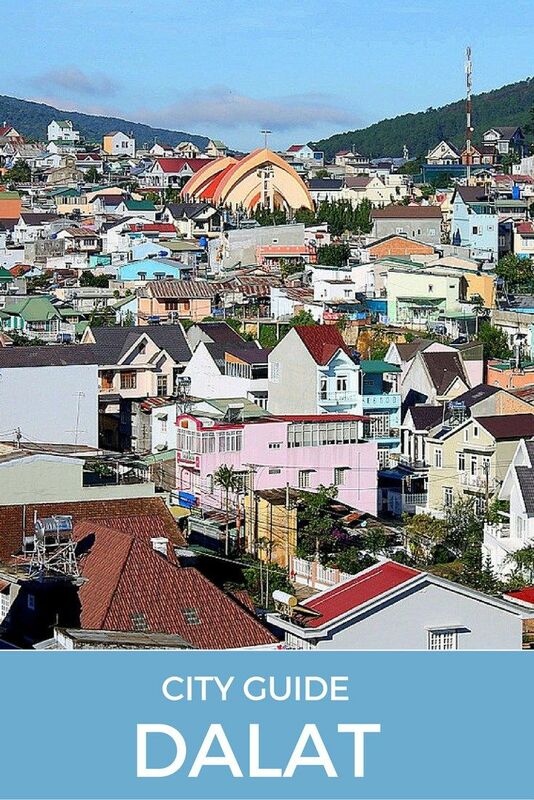 The tourist agency, "Trung Tam Dich Vu Lu Hanh Da Lat," located on Nguyen Thi Minh Khai, is not recommended due to their unethical practice of duping tourists by reserving tickets for Sinh Cafe Open Tour bus for $12 (240,000 dong), then contacting the tourist's hotel to change the ticket for a later Phuong Trang bus, for 120,000 dong. The tickets will have extra zeros whited-out to make it look like $12. - The three palaces and summer home of the colonial-era, last emperor of Vietnam Bao Dai, which is of great interest once you visit these three heritage sites, named as Palace I., II and III, the Dalat Palace Hotel being one of them, with its adjacent Dalat Du Park Hotel, all from the 1922's, together with the Dalat Palace Golf Club, which was built in 1922, to give his majesty the opportunity to practice his golf skills picked up during his years of study in France. The golf course is a awesome site, whether you enjoy the swinging and putting or not, as the coffee shop at the golf course has some wholesome meals of Asian and European making, with great view of the deep green fairways and classy environment. The Palace I is located on the same street when you walk to the Crazy House. It is about 15-30 minutes walk depending on your pace (1.1 km. from Tran Phu, 47 meters elevation gain). Palace II is located on Tran Hung Dao, not far from the Xuan Huong Lake (next to Yersin Park). .A hill-top pagoda coupled with a brief cable car ride over the pine forest. A ride in a UAZ jeep up to the top of Langbiang mountain, with spectacular views of Dalat and the surrounding mountains and valleys. Da Lat market filled with local specialities: strawberry jam, fruits conserves, avocado, artichoke. Dalat train station: take the steam train through the 7km historical line to Trai Mat, from there you can visit the Linh Phuong pagoda. Price for train ride is 124,000d return (January 2013, price for foreigners). Thien Vien Truc Lam Monastery, at the top of where the cable car drops you off (single 50,000 dong, return 80,000 as of February 2017) The monastery (admission free, donations accepted) has a magnificent view over the dams below and its gardens are full of landscaped shrubs in animal form. Extremely peaceful - a great place to relax and soak in the tranquility. People who do not want to complete the round trip could opt for a 4.1 km walk back to Tran Phu. Be sure to bring a map. On the walk back you can go down to Tuyen Lam lake (see below), visit nearby Datanla waterfall and take the bus back to town. Appropriate clothes are requested, no shorts or short skirts, shoulders should be covered. Lang Biang mountain. The 2167m peak is reachable by a steep paved path, ideal for a 3 hours hike, or you can ride in a jeep for 50,000d to reach 1950m peak, Also visit the minorities village under the mountain foot. Thung Lung Tinh Yeu (Thung Lũng Tình Yêu) aka Valley of Love, Phu Duong Thien Vong str. Open daily until 5PM. Admission fee= 40.000 VND. About 5km outside of town, the Valley of Love is common stop on Dalat tours and is very popular with honeymooners. The Valley of Love is also a great spot for canyoning. See contact info below for canyoning operators. Lake of Sorrow or Lake of Sighs, 5km northeast of town on Ho Xuan Huong road. Open daily until 5PM. 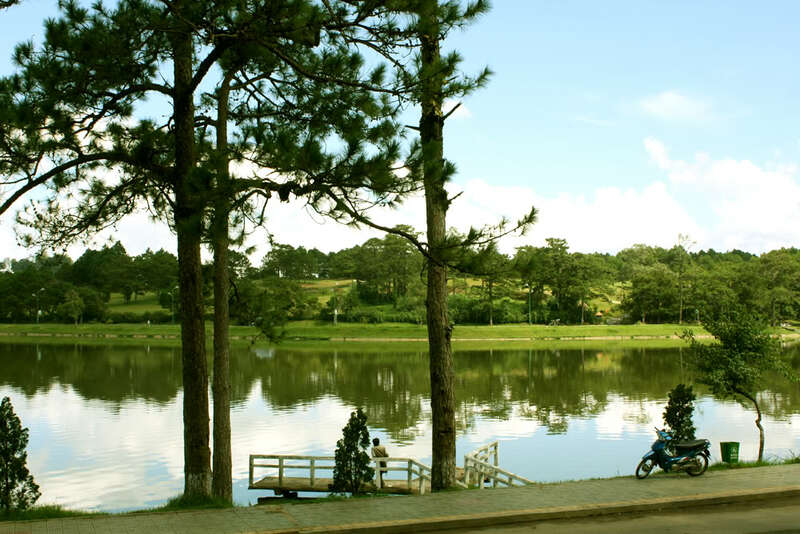 Admission fee= 20.000 VND.The Lake of Sorrow is another common destination in Dalat. The Lake of Sorrow is so-named because of a tale of two lovers, one who committed suicide after the other was called up to serve in the army. Prenn Falls, At the foot of Prenn Pass, about 10km outside of town. Open daily until 5PM. Admission fee= 30.000 VND A very common stop on a typical Dalat tour, Prenn Falls is quite beautiful but is a lot more fun when you're hiking it than just taking pictures of it. 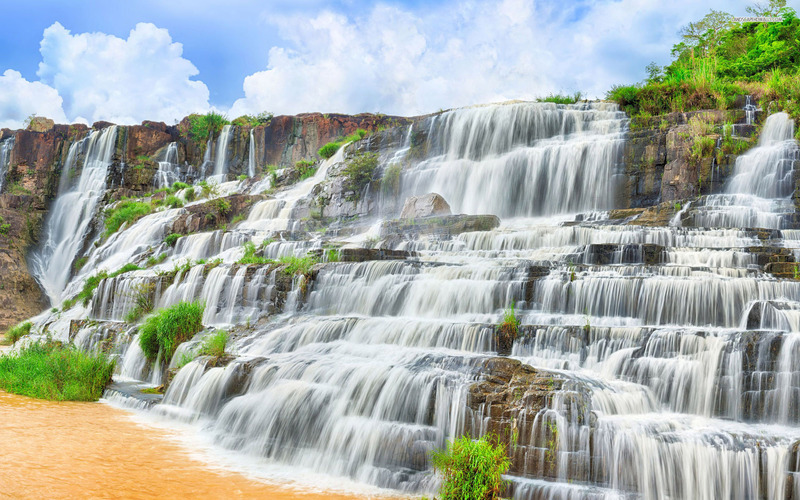 Pongour Falls, 30km south of town on highway 20, it's one of the largest and widest waterfalls in Vietnam and during the wet season is a magnificent sight. Although a dam built nearby has reduced the water flow recently. Most popular activities include: 'Canyoning, Mountain bike, White water rafting, Hiking, Rope course.